Property Details: 3 Bedroom, 3 Bathroom Property with approx. 1140 square feet. 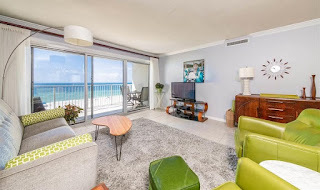 Seafarer condo for sale in Perdido Key. Rare gulf front gem in one of Perdido Keys few "Old Style Florida" low density properties! Enjoy breathtaking views from this updated and stylishly decorated 6th floor unit that features all tile and a large kitchen with stainless appliances, granite counters and plenty of cabinets! The beautifully landscaped property is lovingly cared for and is the best of both worlds for buyers desiring gulf front living and a boating lifestyle! Here you can enjoy the beaches on the Gulf and Boating on Old River with boat slips, boat launch and boat storage with on-site ice machine. Units rarely come available at Seafarer and this is an extraordinary opportunity to own in a community where pride in ownership is obvious. This residence is a non rental and the complex no longer allows new owners to rent, with only a few owners still renting. Buyer to verify square footage.